The newest, biggest trend to hit the salon is what is so playfully referred to as Unicorn Hair. The bright, vibrant, magical colors that remind us of whimsy are now gracing the heads of care-free and light-hearted people everywhere. But what do you need to know before making the decision to turn your locks into a head turning piece of walking art? A whole lot! There are some things you can do before coming in to the salon to ensure that the process runs smoothly and your stylist isn’t hit with any surprises or set backs. 1. DO NOT COLOR YOUR HAIR! This is a big one! 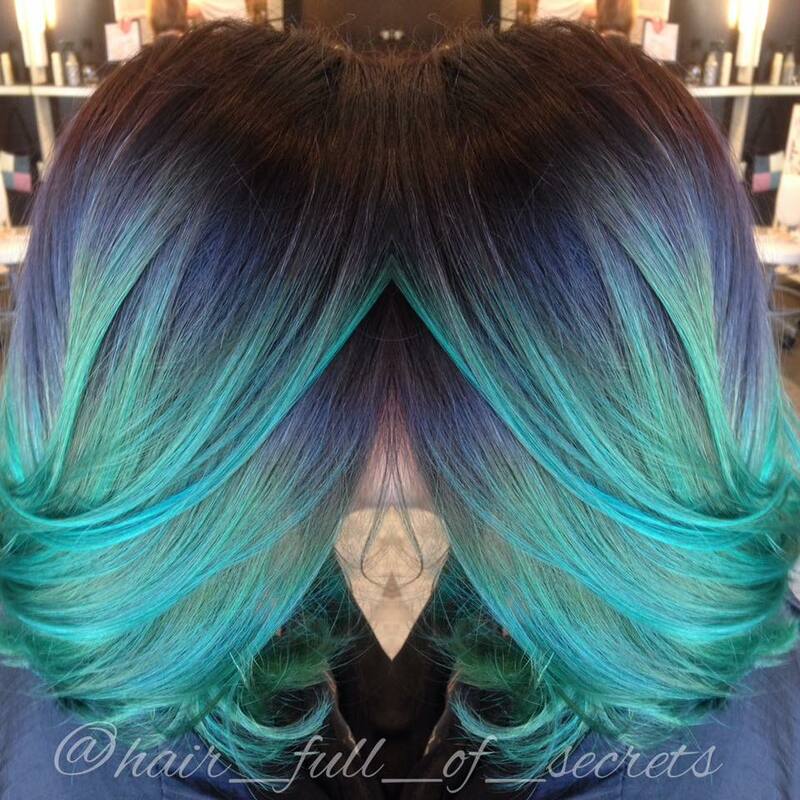 The less artificial color your stylist has to work against the better. There really aren’t too many people out there who don’t have some kind of artificial color on their hair these days. No new color between now and your appointment and be honest with how often and for how long you have colored your hair. 2. Use an at home treatment in the weeks approaching your appointment. Your hair will most likely be going through quite a bit of lightening to get to a level where the bright colors will be their most vibrant. I suggest using Redken Extreme CAT Treatment. This is a protein enriched treatment that strengthens hair after shampooing and before conditioning. Done once or twice a week, this will build the strength of your hair so we can lighten it without compromising its integrity. 3.Come in with clean, dry hair. So we can dive right into the appointment and not have to deal with excess oil or having to blow dry your hair. There are a few things you need to be prepared for day of. 1. Expect a hair cut. There are many reasons why a haircut is absolutely 100% necessary. If doing several different colors or if you are going for a multi-dimensional look, then the haircut will dictate the placement of the color (layering is absolutely essential for the blended, multi-faceted and balayaged looks). If you have a lot of old color on your ends and it is not possible to achieve an evenly lightened canvas, your stylist will have to cut those ends off so the final look is evenly toned. Also, if your hair is just plain damaged and distressed then you will need a cut to promote the general health of your hair. 2. Expect to be in the salon for a fair amount of time. Unless you walk in with perfectly toned platinum blonde hair with no signs of new growth and a fresh cut then expect to be in the salon for a good amount of your day. If you have artificial color in your hair, your stylist will have to evaluate what they want to do about it. Most of the time, the answer is to extract it. This is followed by the lightening process which in itself is the most time consuming part of the appointment. After you have been lightened to the proper level and toned, the coloring process will begin. 3. Expect a heavy bill. Of course, you should speak with your stylist about the cost. There is a lot of time, product and skill involved in creating these beautiful styles and your stylist deserves to be appropriately compensated for this. After spending the day in the salon and spending the money to get your hair to this point of color excellence, you need to make sure you are doing what you need to do to keep the color vibrant as long as possible. Before you leave the salon, make sure you stock up on the proper care and maintenance products and discuss a care regimen with your stylist. Sulfate free shampoo is essential. I recommend Redken Blonde Idol shampoo. It is pH balanced and specifically formulated for hair that has been lightened. A protein enriched conditioner such as Redken Extreme Conditioner will help fortify and strengthen your hair. A weekly treatment or mask is also a must. If your hair is one color your stylist can create a conditioning mask that has direct dye in it to refresh your color as well as treat your hair. I recommend Redken Color Extend Magnetics Deep Attraction Mask. It is a conditioning treatment that helps lock in color. Using styling products that include a heat protectant is also very important. Heat tools will fade color very quickly so be sure to be protected. Enjoy more pictures of hair done by our extremely talented stylists! Let the inspiration flow! Follow us on Instagram @riohairstudio! Follow me on Facebook and Instagram (@jesswilkins)! Color Gloss: Revitalize, Tone & Change It Up! This quick versatile service can change or enhance your look without compromising your hair and without long-term commitment. Is your hair looking dull and faded? Then a color gloss is just what you need! All it takes is 20 minutes for Redken’s Shades EQ semi-permanent color to restore shine and vibrancy to your hair color. Do you like your current color but it’s just lacking shine? No problem, you have the option of a clear gloss which can help your color last longer and create dazzling shine. For my clients who come in every 6 weeks to do a root touch up, I always refresh their ends with a color gloss so the color on the ends look just as new and vibrant as the fresh color at their roots. Has your blonde turned a little too yellow or are your highlights looking a little brassy? Not only does Shades EQ offer vibrant colors to refresh but they also offer delicate, light colors to tone blondes while conditioning at the same time! Are you blonde but not crazy about the tone your hair is or want to try a different shade of blonde? Maybe you’ve always wanted to try strawberry blonde, or you want to be a cooler or even silvery blonde? The results are endless because your colorist can create custom tones just for you! Another problem I have encountered behind the chair is someone who comes in who is entirely TOO blonde. I’m talking overly lightened almost white highlights. This can make your hair look dull, drab and honestly….DEAD. So to add some life back into her hair a delicate gold gloss came to her rescue. A lot of people are afraid of gold tones, but yellow reflects light better than any other hue. You just need the right gold. If you’re craving a change but worried about the commitment of permanent color, a color gloss is the answer. Semi-permanent color gives you vibrant and lustrous results that gradually fade over time. You will not be left with an obvious grow-out line and if you decide to go with a different color next time it will not cause any issues for your colorist. If grays are your issues but you’re not trying to go the route of permanent color, a color gloss can help blend the grays to make them less obvious. However, if full gray coverage is what you are seeking this service is not for you. Redken’s Shades EQ color gloss is capable of so much including creating beautiful works of hair art! Some of the latest color trends involve blurring colors together and having a deeper base color to create depth and contrast. Depending on your starting point your colorist may have to take some steps to get your hair to the necessary level to be able to do these techniques. The above photo is an example of the blur technique. It is a technique where two or more colors are blurred together to create a transition between the two. In this look a blush color and a “peachy” pink color are blurred together with a platinum blonde base color. The photo to the left is an example of the blur technique using “champagne” and beige tones. This look is a lot more natural and blended but it is the same idea where two tones are blurred together to create a smooth transition. Another modern look is the shadowed base. Doing this makes blonde hair look like it has more depth and makes hair look more abundant. After a blonding services your colorist can apply this base color while toning the lengths of your hair and blur the two together. 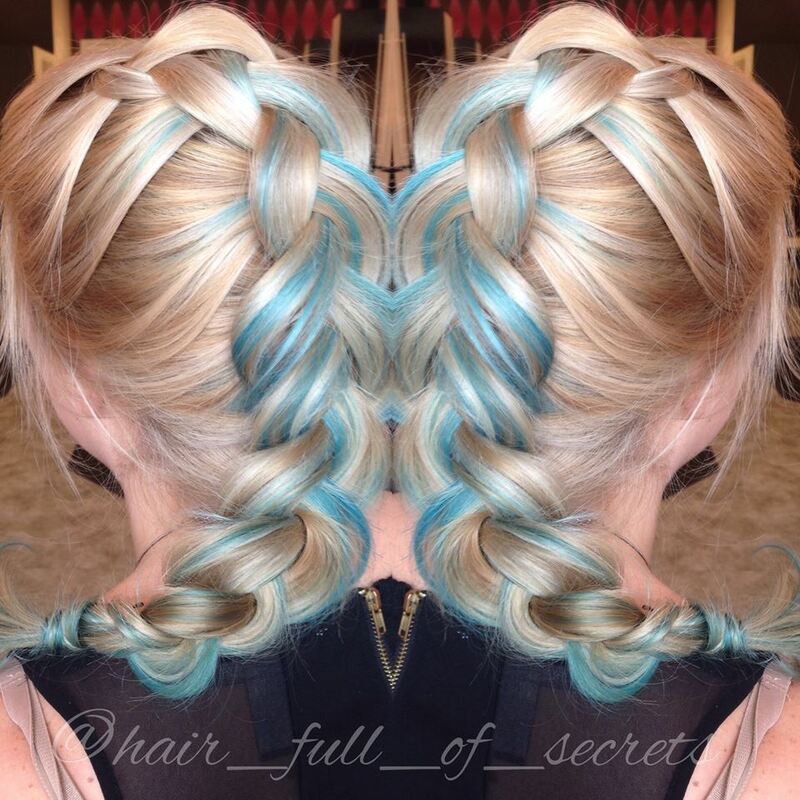 This technique is demonstrated in the photo to the right created by Rio hair stylist Laura Carmichael. The possibilities are endless with Shades EQ! To schedule a consultation with one of our skilled colorists call us at 904-733-8495 or visit us at www.RioHairStudio.com! As we kick off these summer months, Rio is also kicking off our “Protect Your Hair from Summer Air” promotion. We have everything you need to keep your hair looking and feeling its best. Summer in Florida is beaches, pools, cookouts, parties, boats and everything else under the sun. But what many people don’t realize is how taxing these activities can be on your hair. A lot of my clients complain about dryness, breakage, premature color fading and poufy, unmanageable hair. Well we have the solution to your issues as well as some tips for having fun during the summer without sacrificing the health of your hair. When summer rolls around so does the need to be blonde! Its no secret that blonde is definitely the IT color for summer in Florida. But, it does take work to make sure your blonde stays beautiful and your hair stays intact, especially if you weren’t born with those golden locks. But lucky for you there is a hair care line made specially for you! Redken’s Blonde Idol consists of a color-safe, sulfate free shampoo, a tone perfecting treatment (it comes in cool and warm depending on what tone your blonde is) and a spray leave in conditioner. All together this regimen will make sure your blonde stays balanced, beautiful and bright! Blonde Tip: When going in the pool, try not to get your hair wet. But, if you’re going to anyway, rinse your hair and apply conditioner to it combing it through to coat all of your hair before getting in the water. This will create a barrier and prevent your hair from soaking up the pool water. Afterward, rinse it out. Tight ponytails, summer wind, buns, sun, pools: all cause breakage! If you’re noticing your ends just popping off or now you have little hairs around your hairline that you swore weren’t there before, then you need to get on board with Redken Extreme ASAP! The Extreme line is protein enriched to replenish your hair and help strengthen it to fight against split ends. When your hair is exposed to the elements the proteins that hold it all together get weakened. Giving your hair a dose of protein every so often will help and you will notice a difference after just a few applications. I use the Extreme line on myself and I am hooked! I flat iron my hair often and it has never been as healthy and shiny as it is now. Pro Tip: Getting haircuts regularly during the summer is crucial. Think every 8 weeks for a trim. Also, using a protein rich mask once a week will help prevent more breakage and ends splitting higher up the hair shaft. Do you need to get your mane under control? Look no further than Redken’s Frizz Dismiss. They have created what is know as FPF or Frizz Protection Factor. Your factor depends on the texture and density of your hair. It ranges from 10-40! The sulfate-free shampoo is safe for color treated hair and the ultra thick conditioner creates a barrier between your hair and the humid Florida air. Honestly, this product line is a gift from heaven. The FPF 20 Smooth Force spray is a lightweight, smoothing lotion spray that is a great on the go product to have all summer long. Pro Tip: When fighting frizz, make sure your hair is sufficiently moisturized. Dry hair will pull moisture from the air causing it to swell and become unruly. Try a moisturizing mask or spray in conditioner. So Come In to Take Advantage of Our Deals on Summer Hair Care! This promotion is going on now through July so don’t miss out. If you have any questions regarding your hair or if you’re looking for a summer change book an appointment for a consultation today! Call Rio at 904-733-8495 or visit our website www.RioHairStudio.com! Move Over Balayage there’s a New Trend Moving In! It’s called Ecaille or Tortoise Shell and it is making its way into the salon. It’s inspired by the colors in tortoise shell, rich brown and gold tones. It creates a very natural and sunkissed look for brunettes. I think the most famous ecaille look belongs to the beautiful Gisele Bündchen. Her hair is so recognizable and has been a photo that has been brought to me many times over. The beauty of it is in how natural and healthy it looks. The colors flow and blend so naturally together that it looks like the sun did most of the lightening. Other celebrities have been sporting the look such as: Jessica Alba, Jessica Biel, Rose Byrne and Blake Lively. It really is one of my absolute favorite color techniques and if you have been itching for something trendy, fun, different yet natural I definitely recommend it for you! The technique is especially beautiful when you curl or wave your hair because the lighter pieces reflect light in such a way that makes curls really POP! Also the technique is completely customizable to you. If you want it concentrated more around the face or want it really subtle to just break up darker hair, it is completely up to you. In the salon I have definitely been playing with this look and the reactions I get from my clients have been amazing. With how fast paced and hectic the world is right now it is great to have low maintenance color that looks better and better with every visit. As for hair care I recommend, as I do with all of my color clients, a sulfate free shampoo, a protein rich conditioner and a weekly moisturizing mask or treatment. My favorites are: Redken Color Extend Magnetics Shampoo or Redken’s Blonde Idol Shampoo, Redken Extreme Conditioner and Redken Color Extend Magnetics Deep Attraction Mask. These products will ensure that not only you color lasts but you hair is in excellent condition and is getting what it needs to be healthy. 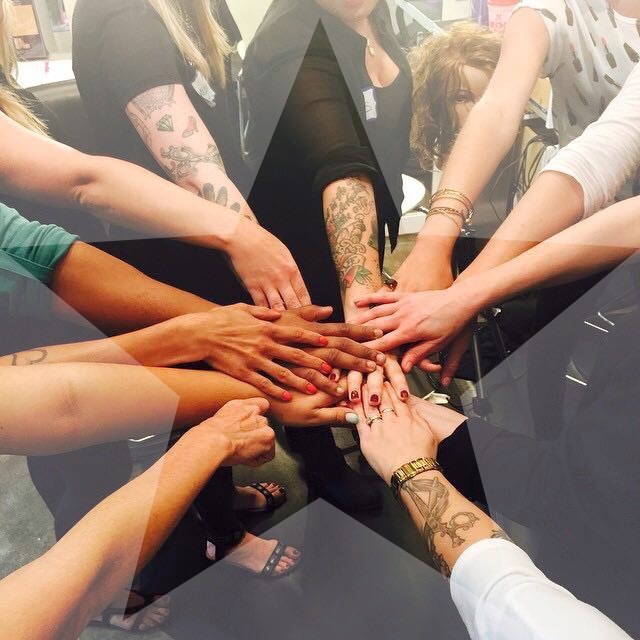 The process starts with a thorough consultation with your colorist. During this consultation your colorist will determine which tones will look best with your features and you will discuss how you like to style your hair, how much time you spend on your hair, and if you participate in any hobbies or activities that may affect your hair. This information will be key when it comes to deciding where to place the high lights and whether or not a haircut will be necessary to achieve the best look for you. Don’t be too shy to ask us questions. We love answering the questions you have and hearing what concerns you may have. When it comes to your hair, I feel like if it concerns you it concerns me as well. After your stylist has gathered the necessary information the color process will begin. Each stylist has their own techniques and preferences when it comes to doing this type of coloring. Just because you saw it done one way on YouTube, that doesn’t mean that is the only way. Your colorist may use plastic wrap or foils or leave the lightener in open air. There are so many ways to get from point A to point B so it is crucial that you trust your colorist. The versatility of this look is what I absolutely love. If you are interested in getting this look for yourself call us to schedule a consultation with one of our stylists today! Call 904-733-8495 to schedule your appointment! Rio Welcomed Gaby Miley from Redken! 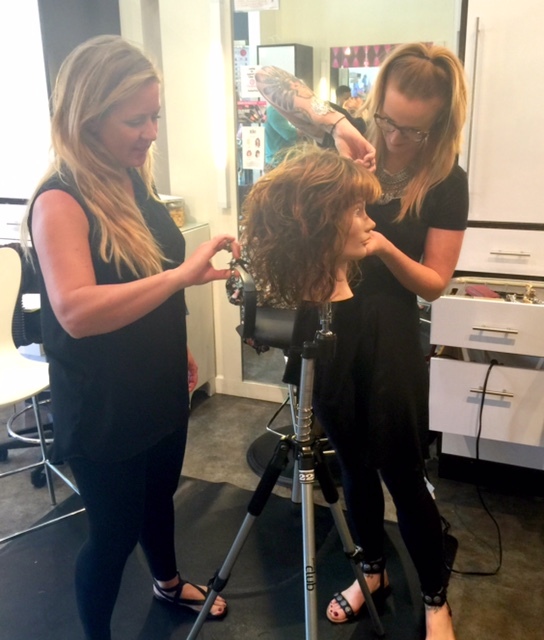 Last week we were happy to welcome Gaby Miley, Redken Educator and Curl Expert. We were so excited to work with her and learn the latest techniques as well as some tips and tricks to provide the best possible experience for our curly haired guests. We learned so much and can’t wait to put our new knowledge to work! Here’s one of our beautiful models Erika! We put our diffusing skills to the test and learned some very useful information about Redken’s Curvaceous line and proper diffuser technique. Gaby was one of the best educators I’ve had the pleasure of working with. She has such a wonderful personality and her teaching abilities are amazing. With all of these products in our arsenal we can custom make a care and styling plan specifically for your curls. There is definitely something for everybody. Consult with your stylist about proper usage and what steps you need to take to achieve those beautiful bouncy curls or textured undone waves! We really appreciate everything Gaby brought to us. The education she has given us is truly a gift. Our team is unstoppable! Come in and consult with one of our stylists to get your curls under control and ready for the summer! Make your appointment today by calling 904-733-8495 or visiting RioHairStudio.com!